The shift to inclusion, as opposed to narrowly defined poverty, as the anchor to the social policy discourse in the Western Balkans is bringing a new awareness of the dynamics of deprivation and a new attention to how different groups experience and are affected by ongoing policy changes. Qualitative research, and particularly structured focus group discussions, can play an important role in informing policy relevant analysis of poverty and inclusion, as demonstrated by a set of recent and ongoing studies commissioned by the World Bank, which cover a variety of topics spanning from the impact of the crisis to the analysis of gender disparities and to the discussion of the impacts of reforms such as pension freezes or reforms in utility prices. 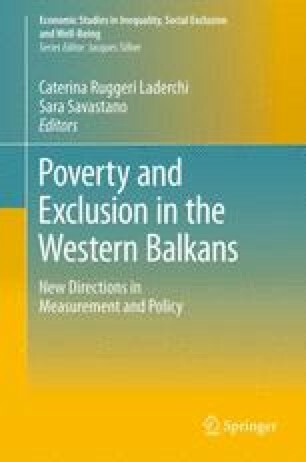 This chapter presents the objectives and the logic which has guided the design of these studies in the context of Western Balkan countries and documents some of the insights learned from these exercises on the exclusionary processes linked to social assistance. The findings, interpretations and conclusions expressed in this chapter are those of the author and do not necessarily reflect the views of the International Bank for Reconstruction and Development/The World Bank and its affiliated organisations, or those of the Executive Directors of The World Bank or the governments they represent. The World Bank does not guarantee the accuracy of the data included in this work. Which groups cannot use it? Rather male day jobs: working on a building site, cutting and chopping wood, slaughtering cattle, loading manure, digging, mowing, hay stacking, collecting wood from creeks, etc.